What is Acoustic Compression Therapy? Acoustic Compression Therapy (ACT) also known as Extracorporeal Shock Wave Therapy (ESWT) describes the use of acoustic pulses to treat acute and chronic pain conditions of the musculoskeletal system. An acoustic wave is an intense, short duration, acoustic energy wave that is generated outside the body (extracorporeal). Acoustic waves are focused so that they converge at a point deep within the soft tissue where the pain originates. These acoustic waves exert a mechanical stress on cells which stimulates re-initiation of stagnant healing processes and the remodeling of various conditions. Acoustic Compression Therapy (ACT) is a new technology using pulses of sound energy called "acoustic waves" to treat painful conditions of the musculo skeletal system. A acoustic wave is an intense, short duration acoustic wave traveling faster than the speed of sound. Acoustic Compression waves have been used successfully in the treatment of chronic pain since the early '90s. The science behind ACT is the same as lithotripsy, a technology that makes use of acoustic waves to break up kidney stones without surgery. Patients undergoing lithotripsy procedures noticed that their unrelated aches and pains were reduced, leading scientists to consider acoustic waves effect on other tissue injuries. Specialized machines were developed specifically with the idea of using the acoustic waves in other parts of the body - and ACT was born. Acoustic Compression Therapy, therefore, is specialized to specifically help treat musculoskeletal conditions. Applications include the treatment of and pain associated with plantar fasciitis, sports related and repetitive stress injuries, and trigger points. ACT is effective in the treatment of myofascial pain syndrome which can be related to acute and chronic sports injuries, repetitive stress and occupational injuries. Research presented at the 2005 International Conference on ACT in Vienna and the 2006 International Conference in Rio de Janeiro demonstrated that acoustic wave therapy is also being studied for use for a wide variety of conditions as disparate as skin ulcers and other chronic dermatological lesions, infections, angina, arthritis, reflex sympathetic dystrophy (RSD), and certain neurological conditions. 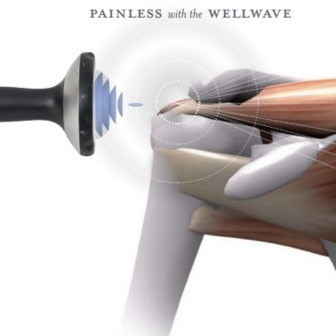 Acoustic wave therapy is a highly efficient, non-surgical treatment of chronic pain in the musculoskeletal system. This is a major area of application in physiotherapy. Chronic pain is one of the most common syndromes affecting many hundreds of thousands of patients. 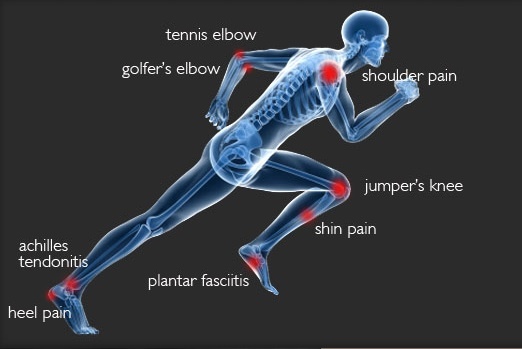 The majority of these painful conditions are triggered by ailments such as tennis elbow, calcaneal heel spurs, calcifications of the shoulder joint and ischemic muscle bands (triggerpoints). A chronic course with the pain continuing over many years, both at rest and during activities, is not uncommon. The use of acoustic waves to successfully treat these conditions is supported by a wealth of clinical experience and scientific evidence. In addition, acoustic wave technology is a valuable diagnostic tool for the precise localization of myofascial trigger points. What does trigger point acoustic wave therapy mean? TPST involves planar or focused acoustic waves that are coupled into the treatment area (trigger point) where they massage and stimulate tissue and promote the healing process. Trigger points are local shortenings in the muscles that can cause referred pain in a zone that is typical for each muscle. How does a focused acoustic wave work? What are the advantages of direct trigger point acoustic wave therapy (TPST) compared with other methods? 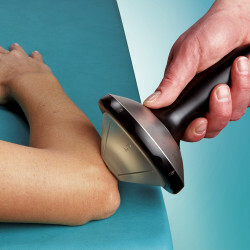 With this technique, the myofascial trigger points can be treated in the superficial and deeper muscle layers. The focus area is positioned on the relevant muscle layer. In contrast to other forms of therapy (compression techniques, injections etc. ), there are no side-effects in surrounding tissue layers. The intensity of the treatment is decided by the feedback from the patient to the therapist so the treatment is not "painful". TPST is used for treatment of the musculoskeletal system in which pain is the main symptom. Very often pain, for which no obvious cause can be found in medical examinations, is also linked to myofascial trigger points. This pain can be diagnosed and treated very successfully with TPST. Comprehensive knowledge of myofascial pain syndrome gained in special courses is essential to this specific treatment method. Treatment with TPST takes between 10 and 20 minutes. Normally, 1-2 treatments per week are performed. A total of 3-5 treatments are necessary before lasting improvement is achieved. With acute pain, a single session is often successful. Chronic long term issues may take up to 8-10 sessions. Are there known side-effects of TPST? No side-effects are known at the energy levels used in TPST. Please take advantage of the coupon below.